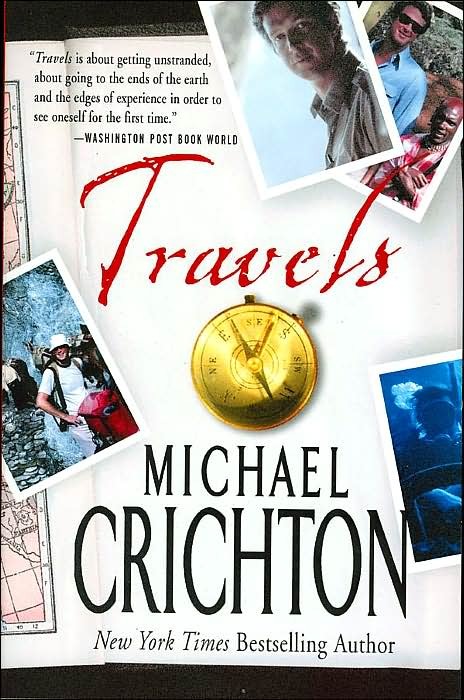 I read Michael Crichton’s autobiography Travels when it became available in paperback, so best guess 1989 or 1990. I would have been either fourteen or fifteen. I remember it being alternately powerful and boring. I inhaled the candid accounts of medical rotations, the details of his accidental evolution as a writer and of course reports on the titular travels to exotic locales like Shangri La or Papua New Guinea. The New Age explorations of auras, channeling, and astral projection did less for me. It’s possible, apparently, to be simultaneously open to them as possibilities and yet uninterested. With used copies available on Amazon for $4 with free shipping, I thought it’d be worth seeing how Travels held up to adult scrutiny. Structurally, the book can be roughly divided into three sections: medical school, travels and inward experimentation. He treks up mountains and through jungles, braving headhunters, elephants, sharks, and even a talking cactus while learning about human anatomy, chakras and psychics. It’s unique. What surprised me was how close some of my presently held beliefs were to Crichton’s. In 2005, I wrote a piece entitled “Of Everything You Know to be Right and True, Only Some Is.” Which, while I never considered this at the time, could have been a subtitle of Travels. Not that Crichton’s innate open-mindedness was confined to medicine; his novel State of Fear evinced a similar, unfortunate belief that global warming was both overstated and incorrect. Even as his arguments are eviscerated by more qualified scientists, however, it’s possible to appreciate the kind of man who would examine the available evidence and come to his own conclusions about the data rather than hew to the accepted narrative. Did I evolve my own worldview evolved in a direct response to Travels, or would I have arrived at a similar brand of independence independently? I’m not sure what the answer to that is. Neither was Esquire’s Anya Yurchyshyn. Many years passed, and I had long since left medicine, before I arrived at a view of disease that seemed to make sense to me. The view is this: we cause our diseases. We are directly responsible for any illness that happens to us. In some cases, we understand this perfectly well. We knew we should not have gotten run-down and caught a cold. In the case of more catastrophic illnesses, the mechanism is not so clear to us. But whether we can see a mechanism or not-whether there is a mechanism or not – it is healthier to assume responsibility for our lives, and for everything that happens to us. There are obvious problems with this theory: no one who hears a six year old with Leukemia interviewed during the Jimmy Fund telethon, for example, is going to conclude it is somehow the child’s fault. But that doesn’t mean that the premise can’t be useful. It is, in fact, the guiding principal behind efforts like HopeLab’s Re-Mission and an equivalent developed at the University of Utah, which employ the video game metaphor to enlist patients as full and equal participants in their treatment. And while those projects are still viewed skeptically, the concept that the mind has power over the body is uncontroversial. There is little debate about the power of the placebo effect, for example. The mind does have power over the body; what remains unclear is how much, and how that may or may not be controlled. That Crichton came to believe this during his medical education is interesting; that it was completely unaddressed by his curriculum, equally so. Reading this book also reinforced the stark differences in the availability of information. From Google Earth to Wikipedia, reading is a fundamentally different experience than it was in 1988 when looking up the details on Kilimanjaro meant a trip to the library rather than a new browser tab. Travels is an interesting book, an in depth look at an interesting man. Imperfect, certainly, but honest about it. His most distinguishing feature, to me, was his unapologetically open mind. This is a book that I’d recommend, and one that I’m sure I’ll be rereading every so often.